Opening night, bunting and all! “Orange Is the New Black” at “Ain’t Too Proud”! Artists are astonishing creatures, and if a great artist manages a certain amount of career longevity, he or she has the opportunity to astonish us over and over and over again. When I heard Joel Grey was celebrating his 87th birthday yesterday, I was struck by how much the man has added to my life as a theater lover, as a New Yorker, and as an aficionado of la belle vie. He has been an omnipresent force in the kind of culture I cherish since my early career, and the fact that he’s still churning out best-in-class work in his ninth decade on this planet is, well, astonishing. Having reached the very pinnacle of acting success while still a relatively young man, winning both the Tony and Oscar for the stage and film versions of Cabaret by the time he was 40, he began expanding his creative palate. Photography became an obsession (I hear he’s readying his fifth book), he began directing (including his Tony Award nominated helming of The Normal Hear tand the current Off Broadway production of Fiddler on the Roof, hailed as the definitive production of our time), and he continued to push himself in new directions as an actor with dozens of memorable performances on stage and screen. Joel and I used to share a doorman — my building’s weekend guy worked at Joel’s building during the week. Every weekend it was the same mantra. Me: How’s Joel? Doorman: Joel busy, man! Joel busy! And at 87, he’s as busy as ever. But it isn’t just his own creative output that keeps Joel out on the town most nights of the week. He’s a voracious consumer and admirer of art in all its various forms. He has always seen the latest art film, attended the hot play, dined at the secret little boîte just moments before the New York Times blows its cover, or is on his way to a gallery show of an artist you haven’t heard of just yet. I think the fact that he is as much a fan as he is a creator is the reason he’s been able to keep his creative juices flowing lo these many years. He’s a living legend, a national treasure, and I wish him a hearty happy birthday! 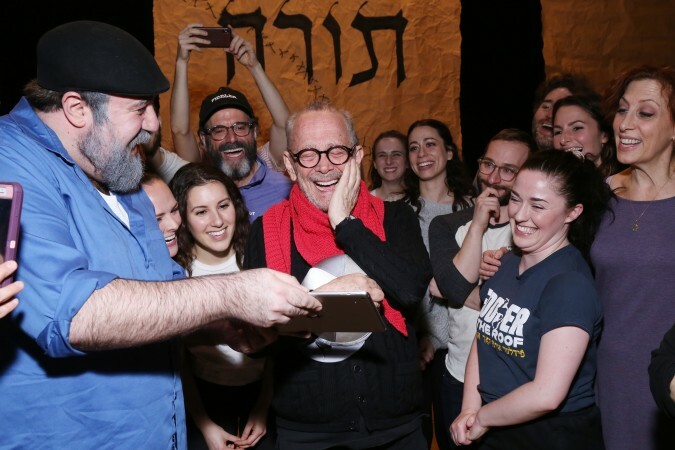 Here is how his Fiddler cast honored him on his special day. Spotted Joy Behar ordering a dozen bagels from Tal on Lexington. Witnessed Andy Cohen dancing in the aisles at Ain’t Too Proud. Caught Missy Elliott trying to train a puppy to sit inside the lobby of the St. Regis. As always, a toast of something sparkling to you and yours!